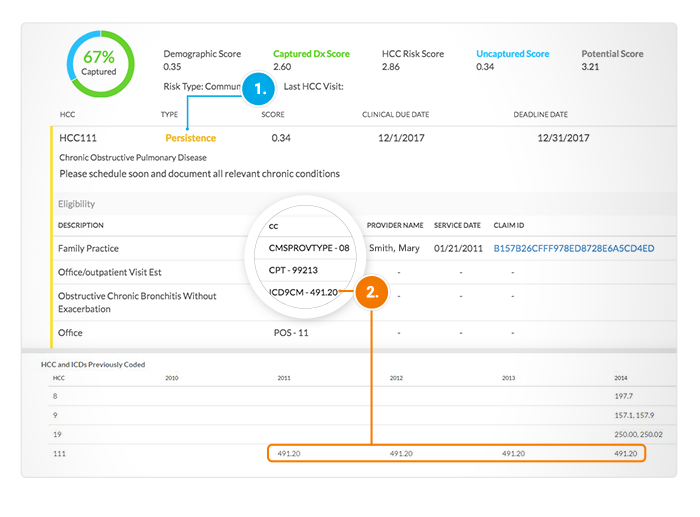 Interpreta's HCC risk adjustment module helps users assess opportunities to successfully identify acute and chronic diagnoses in the population. Proprietary logic helps identify undocumented diagnoses and higher condition severity with transparent clinical reasoning. Interpreta's HCC risk adjustment module is updated every day so that providers, care managers, and payers can manage new events and intervene much earlier in the year. 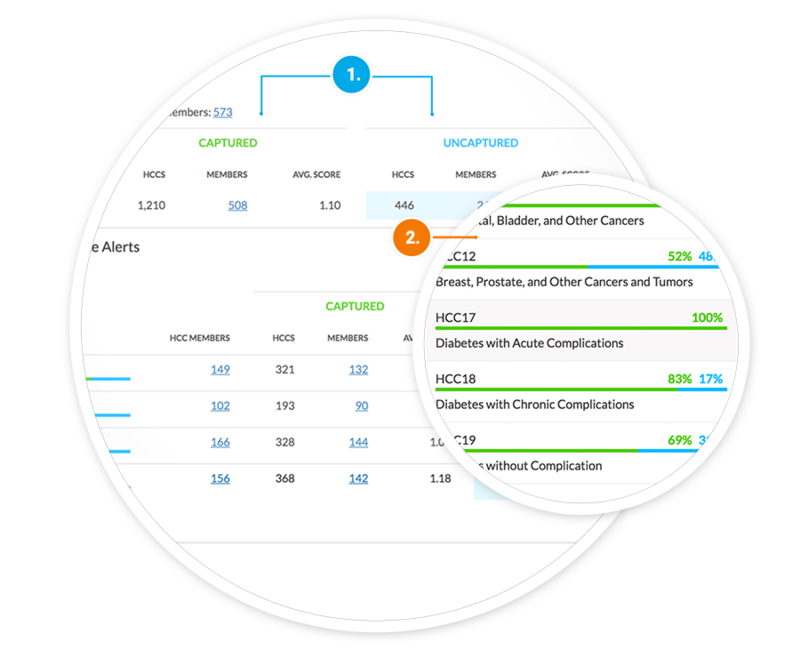 Users can view daily HCC reasoning and status at a single member level or aggregated at the provider and organization levels. CMS weighting and demographics help stratify higher risk members and Interpreta provides supportive claims data at the single member level to substantiate reasoning for an identified alert. Users can export single member or aggregate pages for business intelligence. Interpreta identifies and aggregates members with captured and uncaptured risk-adjusting diagnoses, permitting population management for coding optimization. This is further sorted among organizations and providers for drill down capability. Providers, care managers, and payers can direct campaigns toward risk-adjusting code groups with the lowest performance, largest opportunity size, or highest average potential score. Opportunities for improvement in scoring include diagnosis codes recorded in prior years but inadequately documented in the measurement period. These diagnoses, which are expected to persist from year to year, are displayed along with the potential risk adjustment score associated with successful capture. Interpreta provides supporting information to users indicating the diagnostic codes previously used to capture the risk-adjusting diagnosis, along with a timeline of successfully recorded codes for longitudinal tracking of risk for the individual member.